In its 12th consecutive annual edition, Sunburn Festival is pleased to invite the most respected DJs from across the international EDM scene together with local talents to rock the hearts and minds of eager crowds in India. 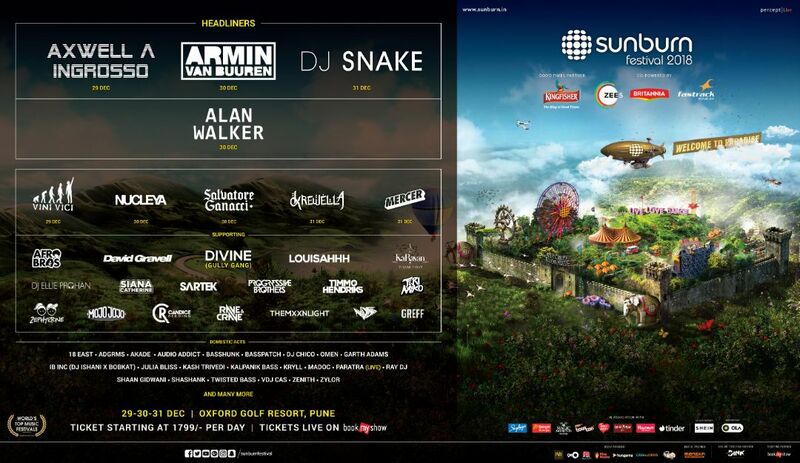 Sunburn Festival is India’s premier 4-day electronic dance music festival. Culminating more than 10 years ago in 2007, the inaugural show was held in Goa – before quickly becoming one of the largest dance music festival in Asia. 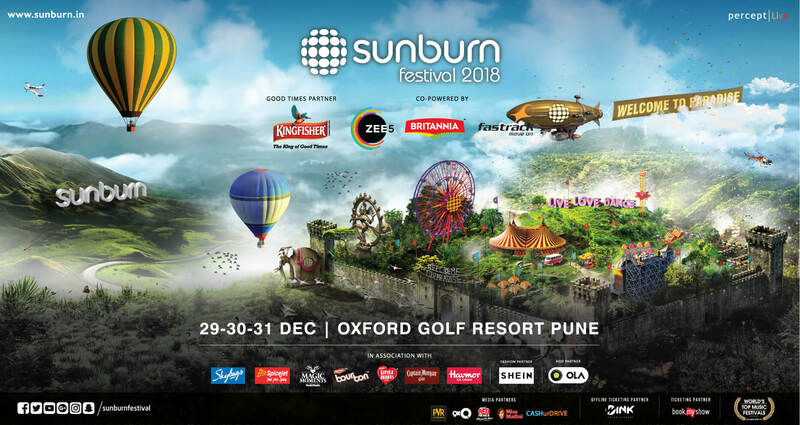 Since moving to the hills of Pune, Sunburn continues to attract massive audiences and EDM fans year after year for the experience of a lifetime. VIP Festival – VIP Festival tickets are VIP Access season tickets to Sunburn Festival 2018. VIP Access includes a separate entry, dedicated parking, exclusive elevated platform with best view at the main stage, dedicated bar and dedicated toilets. VIP Day 1&2 – VIP Day 1&2 tickets are VIP access tickets for 29th and 30th December 2018 at Sunburn Festival. VIP Access includes a separate entry, dedicated parking, exclusive elevated platform with best view at the main stage, dedicated bar and dedicated toilets. VIP Day 2&3 – VIP Day 2&3 tickets are VIP access tickets for 30th and 31st December 2018 at Sunburn Festival. VIP Access includes a separate entry, dedicated parking, exclusive elevated platform with best view at the main stage, dedicated bar and dedicated toilets. GA Festival – GA Festival tickets are general access season tickets to Sunburn Festival 2018. GA Day 1&2 – GA Day 1&2 tickets are general access tickets for 29th and 30th December 2018 at Sunburn Festival. GA Day 2&3 – GA Day 2&3 tickets are general access tickets for 30th & 31st December 2018 at Sunburn Festival. • Possession sale and dealing in Narcotics Drugs and Psychotropic substances attracts stringent punishments under the Narcotics Drugs and Psychotropic substances Act, 1985 which ranges from 6 months upto 20 years imprisonment and fine upto Rupees Two Lakhs. • Consumption of the narcotic drug or psychotropic substance (cocaine, morphine, diacetyl – morphine or any other narcotic drug) or any psychotropic substance is liable for rigorous imprisonment for a term which may extend to one year, or with fine which may extend to Twenty Thousand rupees; or with both under NDPS Act, 1985. Q. How old do I have to be to enter Sunburn Festival 2018? Q. Will I be able to get a refund for the tickets if I do not attend the arena ? Q. Will I need to carry a photo id along for ticket verification purposes ? Q. Are there additional charges for booking a ticket online ? Q. What is the maximum number of tickets I can purchase ? Q. What should I do if I purchase a ticket, but live outside India ? A. No, unfortunately no re-entry is allowed for the event. Your wristband will be cut upon exit. This event has an age restriction. You must be 15 years or older to attend the event.